Do you remember the first time you saw Paris? Maybe you were in college, or it was a special occasion, and you vowed to return. Maybe you have returned, several times. Or maybe life intervened, and you’ve never gotten back—at least not in the way you’ve always imagined. Paris Off Script offers to show you Paris intimately, as a visitor rather than a tourist, in the exhilarating company of other interesting, bright, thoughtful, and fun women like you. How can you see a familiar place in a fresh, new way? It's all about perspective. Paris Off Script is an exclusive travel adventure for small groups of up to five women who want to experience Paris in a different way. Feel more like a local, less like a frenzied tourist. Be more inspired and creative. Explore beyond the obvious and find big moments in small things on a trip that exhilarates rather than exhausts. In French, "tour" is expressed as visite guidée, literally a guided visit, which describes Paris Off Script perfectly. Each visite guidée takes a small group of like-minded women to the insolite, or unusual, places in Paris. Enjoy a varied and relaxing itinerary of secret gardens, hidden streets, intimate museums, and, of course, delicious food and wine. Attend special events with local people designed to uncover a Paris many people never see. We are explorers seeking to inhabit Paris not just visit it. We slow down to be astonished. We relish inspiration anew, understanding that a transformative experience depends on a bit of serendipity. Ultimately, we discover that the good company of companionable people can improve your well-being and create lasting memories. Why choose me as your guide? I'm Lane Rosenthal, your friend in Paris. In 1974, the year I graduated from college, French writer Georges Perec spent one weekend in various cafés on the Place St.-Sulpice observing everyday details often missed but always present. He described "what happens when nothing happens." Nearly thirty years later, I visited Paris for the first time and, dazzled, fell hard in love with the city. At first, I thought I'd never tire of gazing at the Winged Victory of Samothrace in the Louvre. Eventually, though, I began to wander the streets, sometimes with purpose, but more often with only the intent of discovery. I was never disappointed. What I have discovered is that if you open yourself to Paris, the city will, at the most unexpected times, share its secrets with you. I have worked in a variety of fields—including academia and the financial sector—and have experience writing, editing, and teaching. I have raised two children and laid two parents to their final rest. Propelled by curiosity and possessing the enthusiasm and energy to follow where it leads, I am embracing my next chapter. Paris is my passion. Paris Off Script brings that passion to life. Allons-y! Is there ever a bad time to see Paris? Not according to Audrey Hepburn, who, as the title character in the movie Sabrina, says, "Paris is always a good idea." Together we will discover the magic that is Paris. 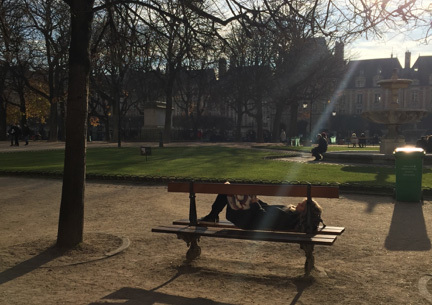 So, if you get starry-eyed, if you light up whenever someone mentions Paris, join us! "We'll always have Paris," Rick says to Ilsa in Casablanca. With Paris Off Script, you will, too. EACH TRIP IN 2019 INCLUDES A VISIT TO A FABULOUS WINE, CHOCOLATE, OR FOOD SALON! Winter in Paris. Cassoulet, soupe à l’oignon. The city is a silvery monochrome of sky, mansard roofs, and cobblestones. In winter the gardens are punctuated with green, but signs urge care: La pelouse se repose, the grass is sleeping. Paris is a riot of color and intoxicating scents in the spring. Skeptical Parisians, bundled up in winter coats, spill out into the parks and cafés, luxuriating in the longer days and awaiting the season's first fragrant strawberries. Blue sunlight slants through the bare trees at an angle that makes the days shorter, leaving more time to see the stars overhead and the city aglow. A perfect time of year to enjoy an afternoon pastry with tea or chocolat chaud.